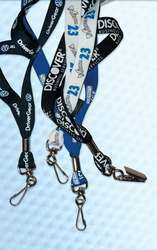 A 3/4” wide x 18” long polyester lanyard with either a metal J-Hook or Bulldog attachment and a plastic breakaway located on the bottom of the lanyard. Price includes a one colour, one side. Production time approximately 7 days after approved artwork. Made from 100% recycled PET bottles. 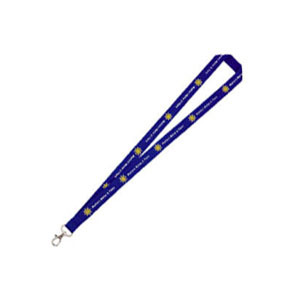 A 3/4” wide x 18” long polyester lanyard with either a metal J-Hook or Bulldog attachment and a plastic breakaway located on the bottom of the lanyard. Price includes a one colour, one side. 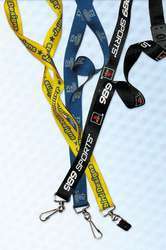 FEATURES Silk screened Very good detail and clarity Second colour & second side printing is available. Additional run charges apply. Rush available Minimum order 100 pcs. FREE SETUP! **First Colour only. $59 per additional colour . Any colour available Incredible detail and clarity. 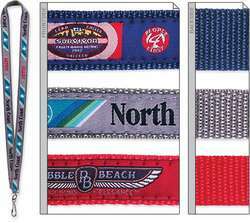 Soft polyester webbing 3/8", 5/8", 3/4", or 1" width, 35" length. (different materials available) Materials not available in all widths. 12 - 15 days production time Rush available Minimum order 250 pcs. Set-up charge of $147.50 per colour (white - no charge) . 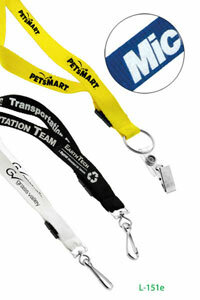 LEAD TIME 10 business days sample; 15 business days production Minimum order 100 pcs Setup $59 . 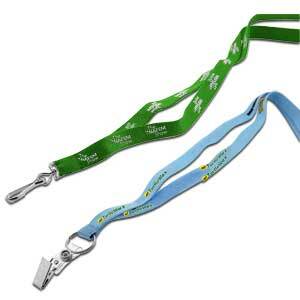 1/2" wide x 18" long polyester lanyard. 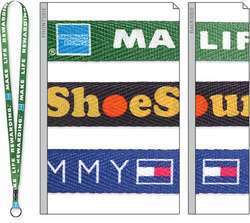 Price includes a one color, one side, step and repeat imprint and a large selection of attachments. 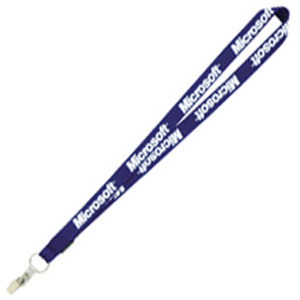 3/4” wide x 18” long polyester lanyard. 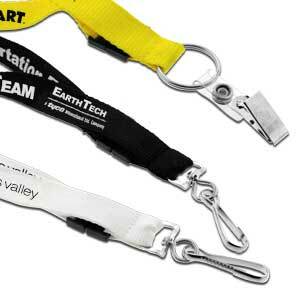 Price includes a one colour, one side, step and repeat imprint and a large selection of attachments. Color/s : Standard Colours: Red, Orange, Yellow, Green, Forest Green, Teal, Navy Blue, Reflex Blue, Blue, Light Blue, Purple, Burgundy, Brown, Gray, Black, White or for $50.00 we can PMS match colour. Dimensions H 9" x W .5" x L 7.25".